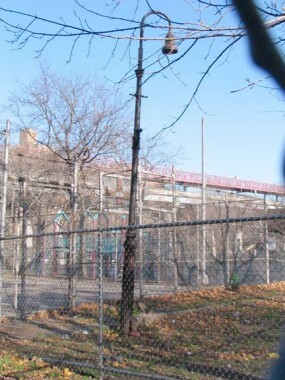 Having visited Vinegar Hill, Brooklyn and pretty much found it just like it was when I first photographed it in 1998 (except for a missing church here and a new luxury crap condo there) I then visited another FNY old favorite a few weeks later — a rusted lamppost in a narrow strip, of unclaimed territory between a park and a housing project. 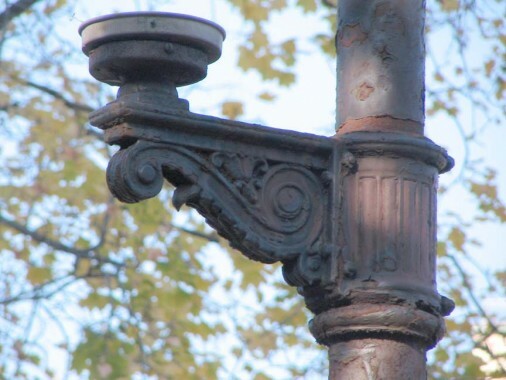 It marks a rare lamppost design and delineates a lost neighborhood — Manhattan’s grid system once dominated this area,the streets lined on each side with tenements and associated businesses – candy stores, groceries, laundries. 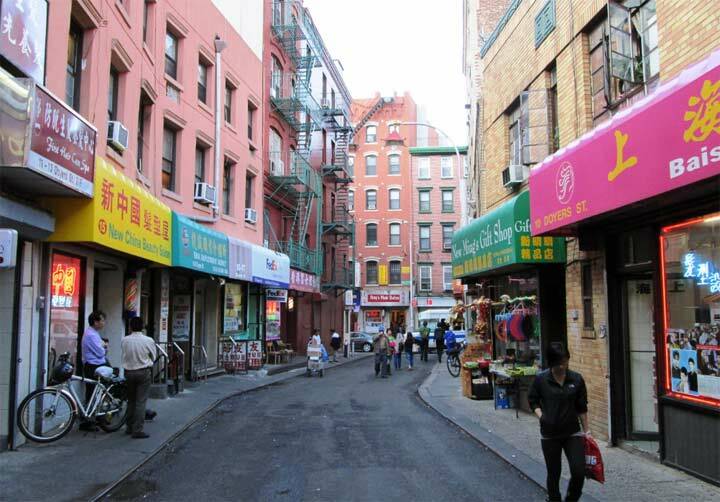 The heavy bulldozers of urban renewal moved into this Lower East Side neighborhood beginning in the 1940s, and where the corner of Sherriff and Broome Streets used to be you’ll now find the borderline between the Hillman Houses and a park and basketball court facing Delancey. 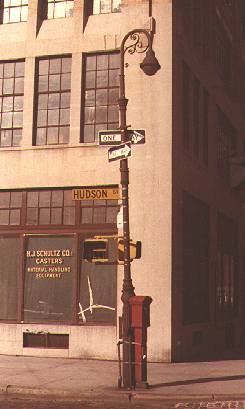 Somehow, some way, a patch of green and a lamppost that used to be on the NW corner of Sherriff and Broome has survived. It was there in 1998 when I first staggered through here in a cold December, and it is here unchanged and thankfully, not mutilated any further, in 2009. 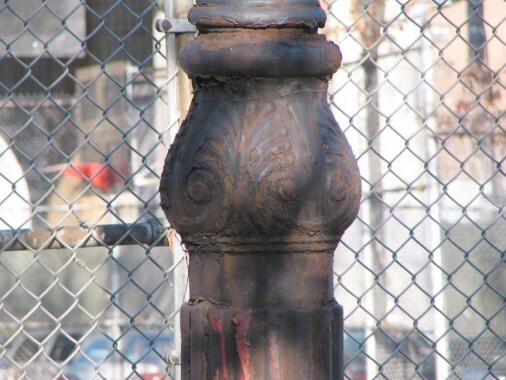 Many of NYC’s classic veteran lampposts have bitten the dust since over a decade ago. But the Sheriff* Bishop Crook abides. *The word sheriff isis misspelled on the title card. Apologies. The Sheriff Bishop sits in a patch of grass that is nonetheless protected from vandals and poachers by a locked chain link fence. 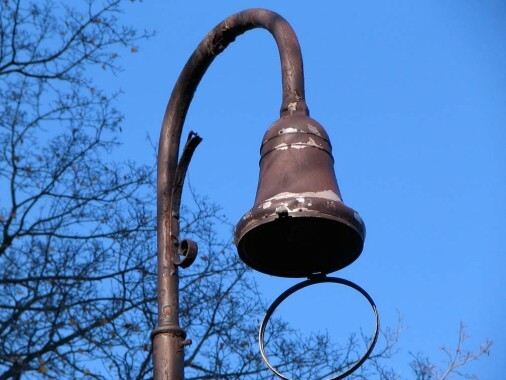 It carries no landmark protections and it can be torn down at any time if the city wants the property for something. 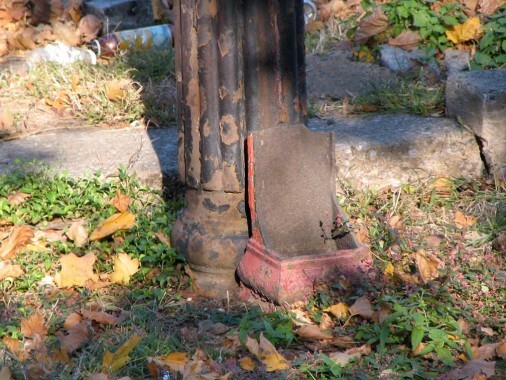 The post is likely a Type 6BC, a specialized Bishop Crook with a narrow shaft and base used for narrow sidewalks. 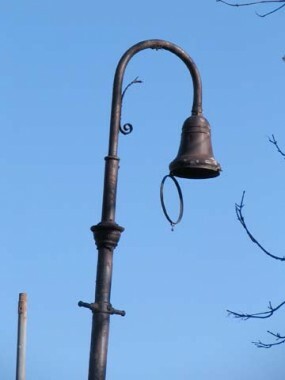 This type, like early Bishop Crook designs, employs a ladder rest crossbar, a tribute to the days when gaslights were lit and unlit by the old lamplighter. 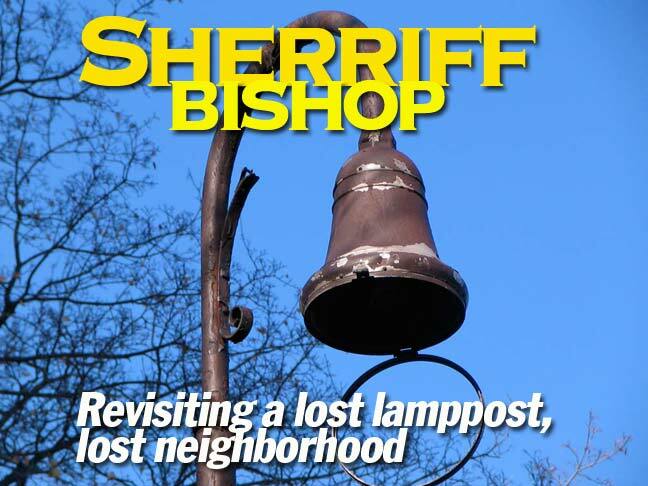 What did the Sheriff Bishop look like when it was working? These photos from the Bob Mulero Collection provide the answer. This was a Type 6 BC in an uncharacteristic locale on busy Hudson Street. It looks like a breeze from a passing tractor trailer could knock it down and that’s probably close to how it met its demise. 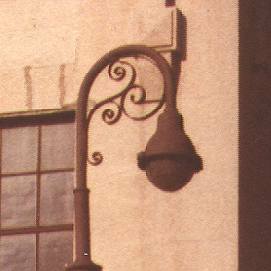 Note the distinctive scrollwork — all Crooks have the same scrollwork these days, but there used to be a variety of designs. I have a zoom lens these days — I didn’t in 1998 — and I can get up close and personal with these posts now. 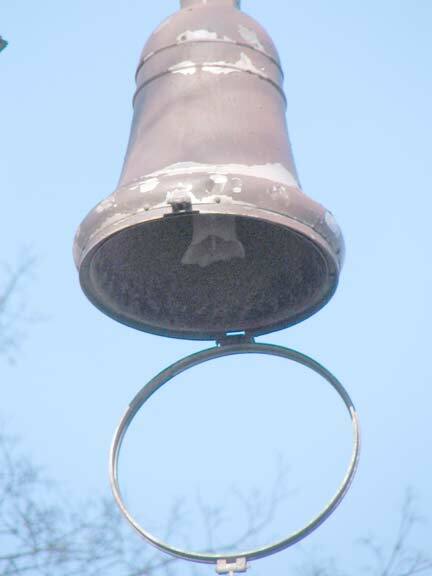 The interior of the Bell luminaire has its own secret. If you use Photoshop and lighten up the picture a little to see the shadowed area better, you can make out a shattered incandescent bulb that is still there. 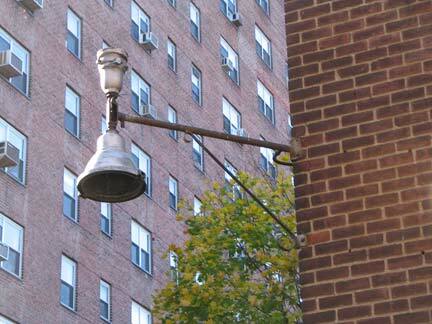 — and remains of a fire alarm; alarms were frequently attached to lamppost bases. Could those be old curbstones in the background? 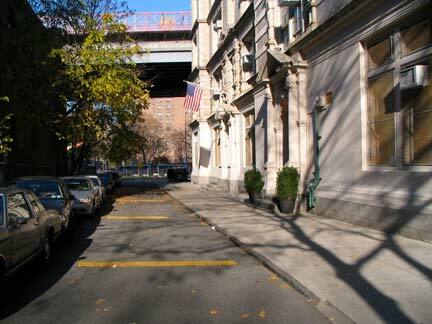 Another Ancient One can be seen a block to the east, in which a short piece of Cannon Street has been allowed to remain as it borders PS 110. 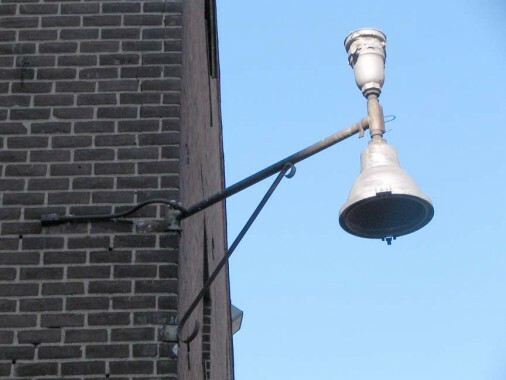 On a parking lot building opposite the school, we see a wall bracket, complete with rare fire alarm light attachment, that once lit the corner of Cannon and Broome. Let’s reactive these two geezers and show NYC how illumination in style was once done! Page completed December 2, 2009.